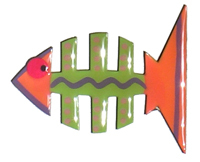 My fish magnets are available both retail and wholesale. I offer a variety of shapes and sizes, colors schemes and designs. Because fish magnets are handmade, your order will be delivered to you in 2 weeks. Thank you for your order!